Spectroscopic Ellipsometer is widely used for thin film analysis and measurements. Holmarc’s spectroscopic ellipsometer incorporates Rotating Analyzer Ellipsometry technology to characterize thin film samples. It uses a high speed CCD array detection to collect the entire spectrum. It measures films from nanometer thickness up to tens of microns and the optical properties from transparent to absorbing materials. It accurately measures optical constants like refractive index, film thickness and extinction coefficient. Our standard system comes with Quartz-Halogen lamp for visible through IR range. Our spectroscopic ellipsometer software allows the user to measure and analyze multilayer thin films and complex thin film structures. 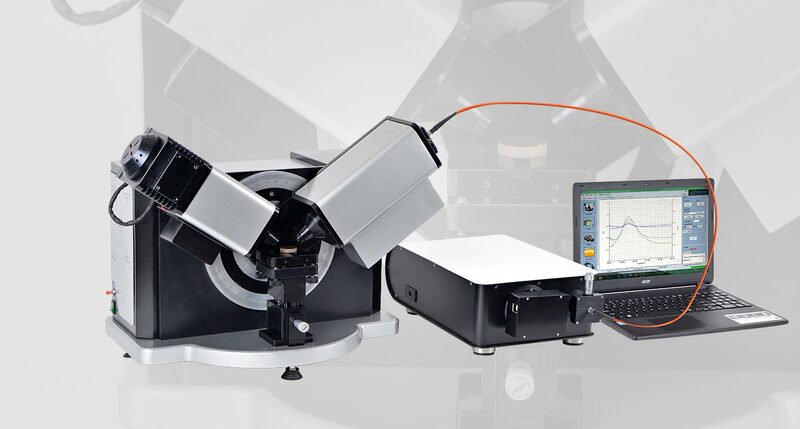 An autocollimator, Z stage and tilt platforms are provided for sample alignment. XY motorized stage and motorized rotation stages are provided as unoptional feature for mapping thin film uniformity. Ellipsometry is a highly sensitive technique for thin film analysis. The principle relies on the changes of the polarization state of light while reflecting from a surface. Where Ψ and Δ are the amplitude ratio and phase shift of the p and s components respectively. Since ellipsometry is measuring the ratio of two values, it is very accurate and reproducible. Need Customization for measurements. HOLMARC's experienced support engineers will be glad to help you. Call us at +91 484 2540075 or send us a mail to mail@holmarc.com or sales@holmarc.com. Holmarc can provide custom spectroscopic ellipsometers to fit a wide variety of applications.